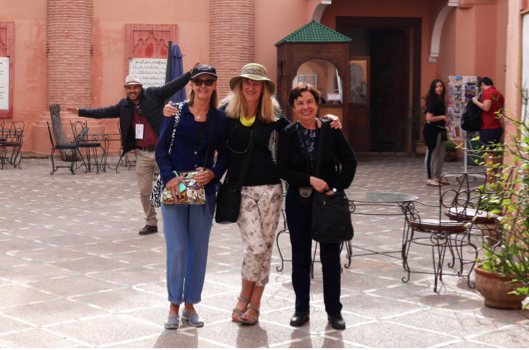 "Culture, Landscapes, History, Food, Colours, Kasbah's, beautiful Riads, Souks and interesting People. An Artist's and Photographer's delight, optimized by amazing light, dawn and sunsets. Morocco has it all, oh, and so much fun. Kerri and Noel were the "Dream Team." They prioritized our enjoyment, satisfaction and skill enhancement. Kerri's guidance and tireless focus on her clients was impressive. Noel's knowledge of the Arts and History interspersed with a very witty humour, kept us all entertained. Noel's Sketching, Art Tuition and Workshops were so illuminating; I took so much away from this experience. I'm now so excited about my art going forward and cannot wait to share our Morocco experience with my Artist friends and anyone else who wants to listen. Taking away such great memories, of our time with new friends and looking forward to our next "Art Travel Adventure." "We stayed in superb, high quality, traditional riads, stunning landscapes, great balance between"We stayed in superb, high quality, traditional riads, stunning landscapes, great balance between travel and time for photography and art practice. On the art side, Noel gave practical demonstrations including working with oils, acrylics, gouache, composition, perspective, shadows and highlights and provided feedback throughout the trip. With Kerri's meticulous planning, everything went to schedule. A great learning experience, a trove of photos to work with well into the forseeable future. Highly recommended! "In January 2018, I travelled with Kerri Ainsworth to Mexico, and had one of the best holiday I've had in ages! Kerri's extensive knowledge of Mexico, and ability to converse fluently in Spanish, made everything very easy for me. We stayed at small B&Bs in Mexico City, San Miguel de Allende and Guanajuato and all three places were delightful, aesthetically beautiful and with vivacious and kind hosts who provided opportunities for social interaction over evening cocktails and delicious breakfasts. As an architect, I usually travel with a sketchbook, but on this trip, Kerri inspired me to take my sketching to new levels. Kerri's training as an artist meant that she was able to suggest new techniques for me using watercolours and coloured inks. I was very pleased with the results. Without Kerri's enthusiasm for Mexico, I wouldn't have thought to travel there - and now I'm hooked and hope to go back and explore more." Anne Warr is a Heritage Architect who lives and works in historic Millers Point. Anne is very fond of travelling, walking and sketching. "Thank you Kerri, you have left me with fabulous memories I’ll treasure. Every day filled with stunning landscapes to explore. Cosy meals fireside, and great conversation in the wonderfully authentic Ross River Homestead. And Idris was a gem, kind, generous and wise, not just a great painter. Lots of rich fodder to inspire me for many days to come." Suzie Riley is an artist from Adelaide who recently joined us on an art adventure in the outback with Idris Murphy. "Thank you so very much to you all for the wonderful Art Workshop in the Hunter Valley. It was very well organised, a happy group, top tuition, access to the well-travelled library, a great choice of venue, much enjoyed food and very comfortable accommodation." Indi Mitchell, is an artist and a regular and much valued guest at our workshops. "Thank you sincerely Kerri for a wonderful getaway. You have a genuine gift with people and it shows! As to the artists, Idris and Ross, they are the kindest, most positive and generous tutors around (and I've met quite a few over the years). It's a privilege to share their experience and knowledge. As they say, they are passing on their knowledge so that we can go off and study and eventually be able to tutor ourselves. I feel so lucky!" "In a fantastically intriguing atmospheric setting, unlike anything I've experienced before, we immersed ourselves in the life and culture of two beautiful colonial Mexican towns, San Miguel de Allende and Guanajuato. The highlight for me was staying in a gorgeous 17th century colonial mansion in Guanajuato from which each day we wandered through the colourful streets to a large art studio set in a cool, leafy, walled garden. As I've never had any artistic experience, it was a real revelation to discover that within a few days, under the tutelage of our teacher, Hugo Anaya, a very warm, talented and experienced artist, I produced a series of dry-point prints of which I feel very proud. The group was small, intimate and we all got on extremely well." Hamish Robertson administers an architectural and urban design forum and is a former leading broadcast journalist, producing and presenting radio programs for ABC in Sydney, and has travelled extensively as a radio producer with the BBC World Service. His passion is architecture and current affairs. He had no prior art training. "This was a uniquely personalized trip organised and hosted by Kerri Ainsworth of ART Travel Adventures. I felt completely comfortable and safe travelling with Kerri. Her knowledge of the language and the places we visited gave us access to the 'real Mexico.' As a beginner, I found the printmaking workshop so relaxing. The teacher was incredibly supportive. And I loved the fact that every night we shared the day's adventures with others in the group over happy hour cocktails." Glennis Murphy is an innovator having reinvented herself from professional dancer to business entrepreneur. Her vintage clothing collection is represented in museums nationally and internationally. Married to a well-known artist, she has always been interested in nurturing her own art style. "I've travelled a lot and tourist sites don't do it for me anymore. I loved the experience of doing some self development with my creative side as well as relaxing with interesting people in a really different place. The art workshop was a highlight taking forward my embryonic art skills. Kerri did a great job of managing all the details and creating a social environment that was super fun." Liane Ringham is a Senior Vice President of a North American technology company, entrepreneur, experienced traveller and a novice artist who is keen to develop her creative skills. "Just back from my first trip to Mexico with Kerri Ainsworth of ART Travel Adventures. We stayed in beautiful historic towns, enjoyed the food, atmosphere and had fun celebrating the Day of the Dead festival where the locals paint their faces, dress up and dance in the streets. The Mexican people are very warm and friendly and their culture is rich and vibrant. Travelling with the group was a great way to go." Martina O’Doherty comes from a music and art family so this was a natural choice for her and her artist daughter Lucy. Martina has travelled with her husband’s bands around the world and eaten in some of the world’s leading restaurants. She enjoys having a relaxed schedule in interesting locations. "Visiting Mexico with Art Travel Adventures was great, it was so relaxing having all the travel and interesting accommodation sorted out by Kerri Ainsworth. I'll never forget our printmaking teacher, Hugo Anaya, in Guanajuato whose generosity and knowledge was endless." Lucy O’Doherty, Sydney artist and 2016 recipient of the prestigious Brett Whiteley Travelling Art Scholarship. "Muchas gracias, cannot wait to see you back and we can do it all over again. I very much enjoyed having such a wonderful group here, the energy and the talent was the best I have experienced in a group staying for such a short time. Thank you again and again ART Travel Adventures." Hugo Anaya artist and owner of Alma del Sol Bed & Breakfast, Guanajuato Mexico. "In January 2016, a friend and I went on a 2 week, custom designed tour with Art Travel Adventures to Panama. We are both very well travelled, so were looking for a different type of travel experience, which incorporated our passions for art and adventure. Kerri at Art Travel Adventures designed a trip which suited our needs perfectly. The tour started in Casco Viejo, the old part of Panama City, where we stayed in a gorgeous fully serviced apartment, saw interesting street art, galleries and fascinating architecture. Then it was time for some real adventures! We went to the San Blas islands in the Caribbean to kayak and to hike in the cool jungle mountains of Boquete. The trip was perfectly paced and the final leg of our trip was spent in a gorgeous lodge on a Caribbean island, enjoying the sun, surf, delicious meals and sunset cocktails. We had a wonderful time and loved the combination of pampering and luxury with the contrast of adventure in remote places. I would highly recommend this boutique and very specialized tour company for a truly unique travel experience."